The Modesto 4 Door Barrister Bookcase has lovely sides that begin straight but curve out to an angle from three quarters down until the feet. Exposed mortise joints add handcrafted style to this hardwood bookcase. The Modesto 4 Shelf 2 Door Bookcase is elegant hardwood vertical storage. This bookcase has exposed mortise joints, an arched skirt under the top, and full-length legs that angle outward from the bottom doors to the feet. The classic household will love this bookcase for years to come. The Modesto 5 Shelf 6' Bookcase is elegant to a fault. Beneath the Mission top, the skirt subtly arches. The legs run straight down but near the feet they barely fan like a skirt. Exposed mortise joints adorn this hardwood book shelf. 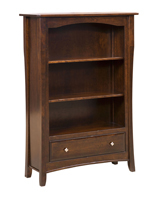 The Mondovi Bookcase pictured above is built in brown maple with OCS228 Rich Tobacco stain. This versatile bookcase can be configured in four different ways. You can pick 38" wide or 50" wide on each style. The Montana Bookcase frames your books in rustic logs with the bark removed to reveal natural waves. The handcrafted bookcase is simply finished—or not—for the pure style of woodgrain. The Montana Bookcase with 2 Doors Storage is rustic in style with its naturally striped woodgrain surfaces and its log corners. It's also versatile, combining a bookcase with a cupboard. Pictured in qs white oak with CF 7992 Asbury stain. Pictured in qs white oak with Michael's Cherry stain. Base Size - 36"w x 12"
The Northport Mission bookcase is a timeless and elegant way to showcase your books and other collectibles. Pictured in quarter sawn white oak with Earthtone stain. This large bookcase is perfect for those book collections that are bursting at the seams. With six shelves there is ample space to organize your books and belongings. Best of all, the solid wood construction mean the bookshelf won’t warp or get ruined with use. The Oakwood family of products is known for its arched panels and classic style. The classic items in this line are made of solid wood. Don’t forget to look into the variety of stains available to match new furniture to your home décor. This large bookcase is perfect for those book collections that are bursting at the seams. With four shelves and one large cabinet, there is ample space to organize your books and belongings. Best of all, the solid wood construction mean the bookshelf won’t warp or get ruined with use. Wood Options: Brown Maple with Onyx stain on case & Micheals Cherry stain on doors. The Old Classic Sleigh design works perfectly on a bookcase. It's gracefully curved contours illustrious, simple, and elegant. The quality of the Old Classic Sleigh Bookcase is second to none, and has plenty of great functional features including four adjustable shelves, two doors, and drilled holes for adjustable shelves behind doors. Customize it so it's unique to your home and family. This piece will make any room gush elegance and charm. Use our drop down boxes at the top right of the page to select options your Amish bookcase. The Old Classic Sleigh design works exceptionally well on a bookcase, and thus we have the 5' Old Classic Sleigh Bookcase. With rounded graceful fronts, and rounded feet, this is one of our personal favorites with the character it brings out in any home. It's fits will with many other styles, and looks outstanding in sets of like styles. Add plain glass doors for extra class, and customize this with piece with several wood types, and dozens of stain choices to get the look you want. The Old Classic Sleigh 5 Shelf 6' Bookcase has a unique face with curves running up the sides. Starting with circular front feet, the legs curve out, up, in, and out again. A smooth rounded skirt protrudes beneath the Mission top. This solid wood bookcase is sure to add dimension and luxury to a classic study. The pictured Open Freemont Mission Bookcase is built in rustic qs oak with FC9018 stain. The Berkley Bookcase keeps just enough books for those with modest collections. The bookcase's small size, as well as its bottom drawer, are meant for traditional or eclectic spaces with diverse function.